On 8th August 2014, the board of Acts29 Church Planting network announced, with deep sorrow, its decision to remove Pastor Mark Driscoll and Mars Hill Church from membership in the network. The reason for this drastic action, according to Acts29, was that Mark Driscoll was guilty of ungodly and disqualifying behaviour. 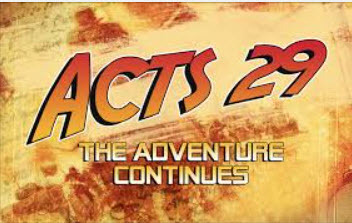 It appears that Acts29 was spurred into action as Driscoll’s ungodly and disqualifying behaviour has increasingly becoming public knowledge over the past year. One of the greatest examples of Driscoll’s ungodly behaviour occurred in October 2007 when two Mars Hill Church elders, namely Pastor Paul Petry and Pastor Bent Meyer, were fired because, Mark Driscoll claimed, they were ‘off mission’, and therefore were no longer suitable for ministry. Only after four and a half years silence, in 2012, has Paul Petry revealed the shocking details of how he was treated by Mark Driscoll and other Mars Hill elders. Caught up in this drama was Mars Hill member Rob Smith, who was concerned that the two pastors should receive a fair trial. And so in October 2007, he wrote an email to Mars Hill elders, requesting that Pastor Paul Petry and Pastor Bent Meyer be given a fair and impartial trial. Mark Driscoll reacted to Rob Smith’s email with fury, and phoned him at home, demanding that he allow the elders come over and confront him. Smith refused, saying: ‘If we’re going to do this, we’re going to do this man-to-man.’ Driscoll, Smith says, exploded and insisted that he would come over with his elders, apparently for backup. Add to all that, some significant personal weaknesses and sins of my own, and I/we needed serious help. I asked you for that help, and in customary fashion, you dropped the hammer. When all of your recommendations on discipline weren’t followed, you came unglued. You cursed me up one side and down the other. You threatened and berated me. I have never been spoken to the way you did to me then. It was vicious and startling. I was reeling and devastated from what I had just discovered with my wife and close friend. You’ve destroyed people, Mark. You’ve ruined people’s reputations. Through your own perverse interpretation of “God’s grace”, you’ve cast people aside who you decided were not “on mission” spoke of “a pile of dead bodies behind the Mars Hill bus.” The pragmatism backfired. What you won them with, is what you won them too, and now there are thousands who have been hurt, and who have hurt others. Beautifully, many of them are finding forgiveness and healing as they reconnect with each other and grow in grace. Please Mark. Just stop. Step down. Resign. Paul Petry describes ‘the harshness, abusive power, anger, manipulation, and control exhibited by Pastor Mark’. These four men are first hand witnesses of Pastor Mark Driscoll’s shameful behaviour. Scripture is clear. ‘A servant of the Lord must not quarrel but be gentle to all, able to teach, patient, in humility correcting those who are in opposition, if God perhaps will grant them repentance, so that they may know the truth’ (2 Timothy 2.24-25). So a true Christian leader is kind and loving, self-controlled, gentle and dignified. A true Christian leader does not use foul, abusive language. Driscoll’s behaviour described above is not the conduct of a true servant of God, but of a false teacher who has proved himself to be an abusive spiritual fraud.